Twisters ripped through portions of The Hawkeye State leaving injury and destruction in their path. Update: Samaritan’s Purse is focused on serving homeowners in Marshalltown where over 700 homes sustained damage from an EF-3 tornado. Evangelical Free Church (3111 S. 6th St.) serves as our base. Volunteers began work on Sunday, July 22. Samaritan’s Purse staff and volunteers pray alongside Billy Graham Rapid Response Team chaplains before starting work on July 24. Staff, equipment, and a disaster relief unit—packed with tools and supplies—have arrived in Iowa after tornadoes ripped through buildings and homes in Marshalltown and surrounding areas on Thursday, July 19. The storm churned through Marshalltown’s central business district, leaving significant destruction in its wake. Pictures of damaged cars and homes and downed trees around town have made news reports. In Pella, seven people were injured after a tornado struck Vermeer Corporation, a manufacturer of industrial and agricultural equipment. U.S. 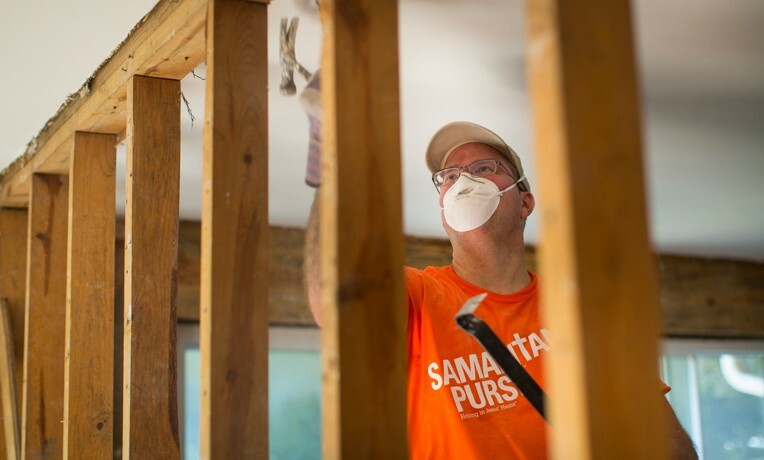 Disaster Relief program managers, accompanied by Billy Graham Rapid Response Team chaplains, are on the ground to minister to the spiritual and physical needs of homeowners in central Iowa. Volunteers will be patching roofs and removing trees and debris from affected properties. Please join us in prayer for the hurting people of Marshalltown, Bondurant, and Pella, and remember our staff and volunteers as they begin serving those in need. Note: This story was first published on July 20 and has been updated through July 24.